Preheat the oven to 220°C/425°F/Gas 7. Pour 1 litre (1¾ pints) of water into a large saucepan and bring it to the boil. Crumble in the stock cubes and stir until they have dissolved. Add the chopped potatoes and carrots. Bring the mixture to the boil, then cover, reduce the heat and allow to simmer for 5 minutes. Add the chopped parsnips (180g is about 2 average sizes ones) and leeks (again about 2 average sized ones). Re-cover the pan and bring back to the boil, then reduce the heat and simmer for 10–15 minutes until tender. Using a slotted spoon, transfer the vegetables to an ovenproof dish, reserving the cooking liquor. Scatter the sweetcorn over the top of the vegetables. Bring the cooking liquid to a rapid boil, uncovered, and boil to reduce the quantity by about half. If necessary, thicken with cornflour. Remove the pan from the heat and crumble in the goat’s cheese. Stir until the cheese melts, to form a sauce. Season to taste and pour over the vegetables in the dish. To make the topping, sift the flour into a bowl, add the butter and rub it in with your fingertips until the mixture resembles coarse breadcrumbs, grate and then stir in the Cheddar cheese (mature is best if you can). 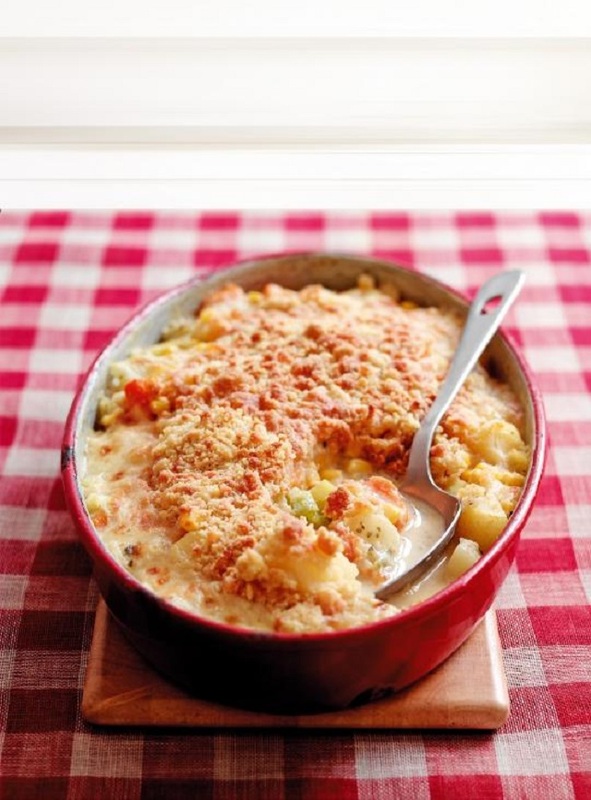 Sprinkle this crumble mixture over the vegetables and bake for 20–25 minutes until the topping is golden and the sauce is bubbling.